Share Abbey with all your friends. In need of Heating or Cooling? If you are in need of , energy-saving tips, an upgrade equipment, repair, or maintenance service on your central heating & air conditioning equipment or my engineering expert advise; I am your man. I am well-known for my integrity and honesty. I would like to extend my services to you. I have the best qualified HVAC Technicians and Installers, as well. I am a Mechanical Engineer and owner of Banner Heating & Air Conditioning. I specialize in troubleshooting any HVAC system and installing custom design equipment. I am an A+ member of the Better Business Bureau. 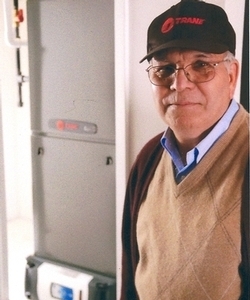 I am a Trane Comfort specialist and I specialize in installing, trouble shooting high quality Trane equipment, as well. I am NATE Certified, State Licensed, Insured, and Bonded. My maintenance service will prolong the life of your air conditioning system, which in return can save you hundreds of dollars off your summer electrical bills, as well as, prolong the life of your heating equipment during the long, cold months. My company has won several awards from Angie's List Super Service Awards 2008-2011 & 2013. Also, I am a dedicated Trane Manufacturing Company Dealer in which I am one of the top Trane Comfort Specialists covering the San Fernando Valley. Financing is also, available on eligible, Trane Comfort Equipment.